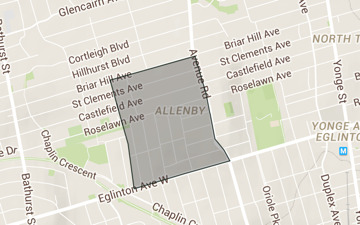 Allenby is an area located in Northern Toronto. It features mainly detached homes and is very suitable for families with young children. Forest Hill has been a popular, wealthy neighbourhood since the early 1900s, filled with elaborate and impressive homes in terms of both architecture and size. Characterized by large homes from the early 1900s, Forest Hill South contains some of the oldest and grandest parts of Forest Hill architecture. Running from St Clair Avenue down to Rosedale and from Spadina over to Bathurst, the Casa Loma neighbourhood gets its name from its most prominent building. The Bedford Park-Nortown neighbourhood is a popular and established North York community. What was once a middle class residential area north of the city is now a bustling neighbourhood filled with cafes and restaurants. 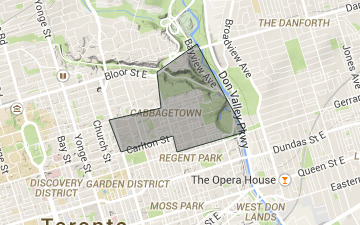 Humewood-Cedarvale is a wealthy family-oriented neighbourhood that sits between Oakwood Village and Forest Hill South. Undoubtedly the biggest jewel of the area is Cedarvale Park, a tree-filled 35 acres with a stunning ravine, which bisects the neighbourhood and is brimming with activities for all ages.